Watt gauge with watt zones - this gauge focus on the watt values and show the absolute power and the % of FTP on the upper line with large numbers. 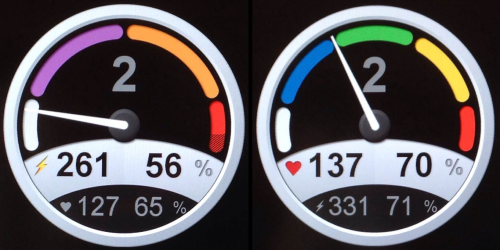 On the lower line the heart rate is visible. Watt gauge with HR zones - this gauge focus on the HR values and show the absolute bpm and the % of Max HR on the upper line with large numbers. On the lower line the watt values is visible. 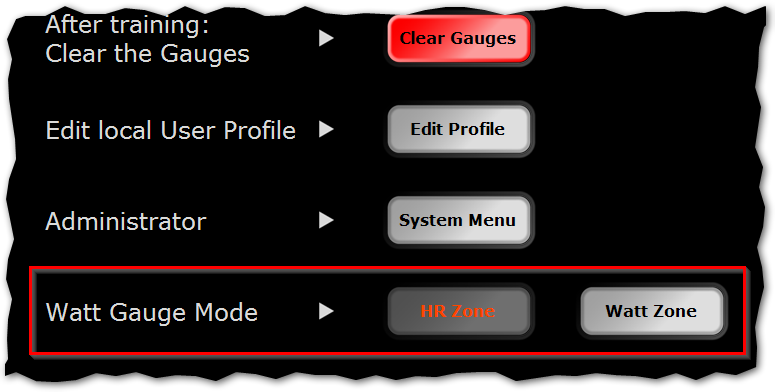 To change between these two gauges press Menu in the upper-right corner and select the desired Watt gauge Mode. This can be done both before and during the workout.